Holding onto summer while trying to embrace oncoming fall? Same here! 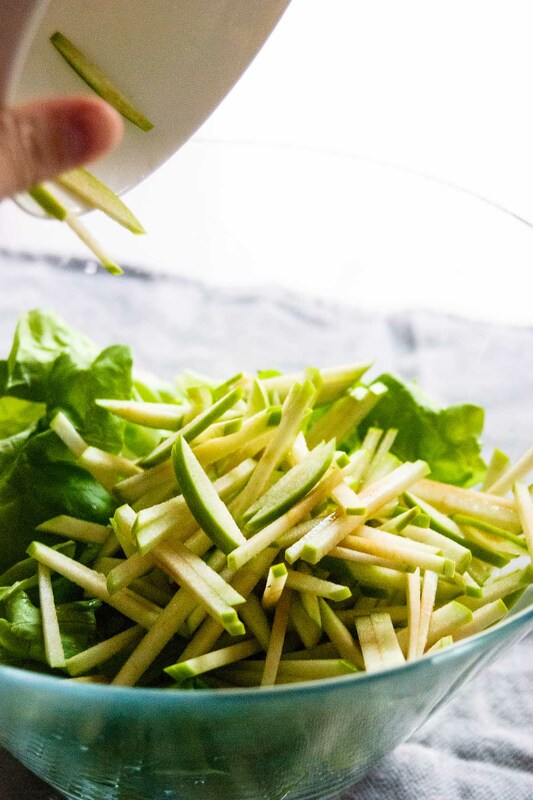 This Lemony Apple Salad holds on to summer with a bright citrus flavor, while bringing in fall with crunchy orchard fresh granny smith apples! September first hit and all of a sudden it was cold in Montreal. Then the actual fall season begins and it’s so hot outside that they had to cancel the Montreal Marathon! It’s just crazy stuff! And so, with Mother Nature unable to make up her mind, I find myself wanting autumn foods because it’s finally fall, but then the heat just makes me want refreshing foods that don’t get me all hot inside (unless I’m at the lab where it’s always cold). To be frank: I’m already sweaty enough due to the humidity and heat – not to mention I need a constant dose of allergy sinus medication and eye drops, and I don’t (TMI) want to have to carry a shammy to wipe the sweat off my face while eating. Just think, I usually go to apple picking with a cozy flannel and jeans, if I go this weekend I’ll need full on shorts, tank top, cap, sunglasses and sunscreen! So with all this mix of weather (and emotion! 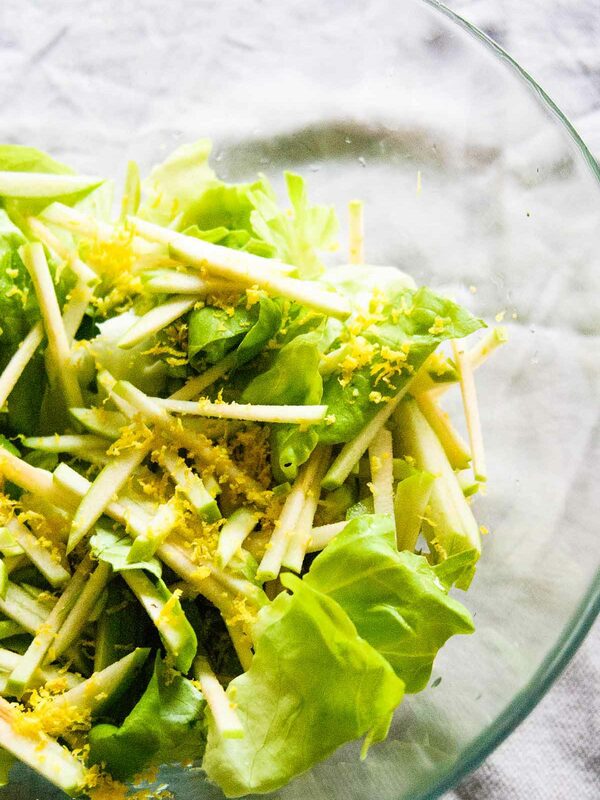 ), this Lemony Apple Salad is perfect. Bright lemon citrus flavor comes through causing a refreshing and vibrant taste on the palette – great for spring/summer; a friend did call this Spring Break Salad when she saw a picture of it. But then you have the addition of granny smith apples, that although are available year-round in grocery stores and can’t be grown in Quebec because of our colder climate, make you think about taking a nice walk in the apple orchard with your boo (a yearly tradition I take part in). 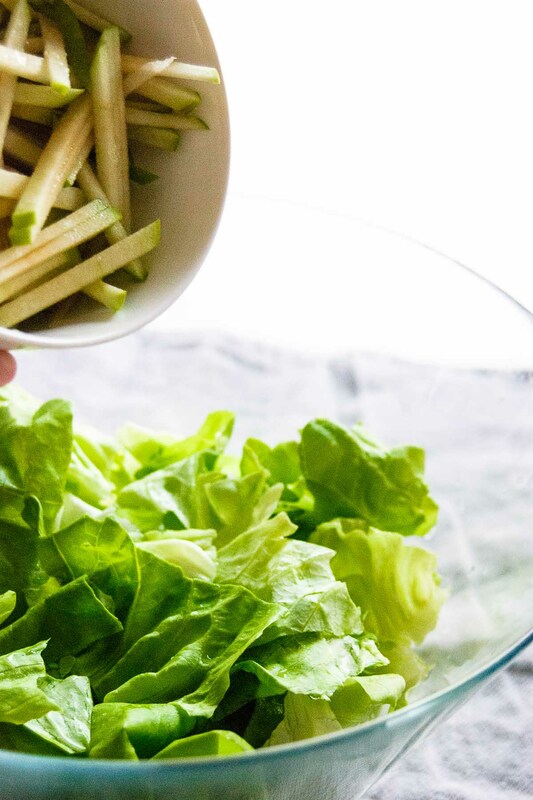 So, by tossing lemon zest and juice, olive oil, some apple, salt and pepper and locally grown Boston or Bibb lettuce you get a flavourful “it’s fall but feels like summer” treat on your hands! Ou also! The lemon juice stops the apples from browning if you mix it up right after cutting the apples – I, unfortunately, let trying to photograph in low light get away from me and my apples browned slightly. Enzyme: a class of protein produced by a living organism, in this context apples, that acts as a catalyst (or trigger) to cause a biochemical reaction. In science, you usually know something is an enzyme when the name ends with -ase. Polyphenols: a class of molecules that are naturally present in a variety of foods, apples included, that can give color to the plant and help it ward off infection. In terms of consuming polyphenols in our foods, they are good (dare I say great) because they have demonstrated anti-oxidant properties in preliminary scientific research. This can be good for those suffering from inflammatory disease and disorders – now I said this is preliminary research, don’t go eat a bushel of apples a day! Ok, now for the apple browning (the same principle can be used for pears and other fruits and veggies). In apples, the browning of the flesh is caused by a process called enzymatic browning (aka a biochemical reaction caused by an enzyme that results in the brown color) that is carried out by the enzyme polyphenol oxidase (PPO) when it is in the presence of polyphenols and oxygen. When an apple is in perfect condition, the skin protects the flesh from oxygen in the atmosphere and therefore PPO cannot carry out its job because there is a lack of oxygen. However, when you cut an apple or it’s dropped causing bruising, you injure the apple’s skin and protective layer causing the flesh and therefore PPO to come in contact with oxygen; when PPO meets oxygen and polyphenols it can carry out its biochemical role in changing the structure of polyphenols resulting in the brown color. So how do you prevent this? Many ways! And probably much more to come seeing that stopping enzymatic browning is very lucrative in the food industry – just think of prepackaged cut apple slices, they’re not brown are they? However, in this Lemony Apple Salad, it’s the use of the lemon juice! Lemon juice is acidic, it contains ascorbic acid and citric acid. It is well known (and I have experimented with this in my undergrad teaching labs) that enzymes function optimally at specific temperatures and conditions; change one or the other, or both, and you will slow down and sometimes halt the process. In the case of lemon juice and apples, the environment has changed to be more acidic and PPO cannot function as well, thereby slowing down the biochemical reaction. Anyways, enough of the nerdiness! 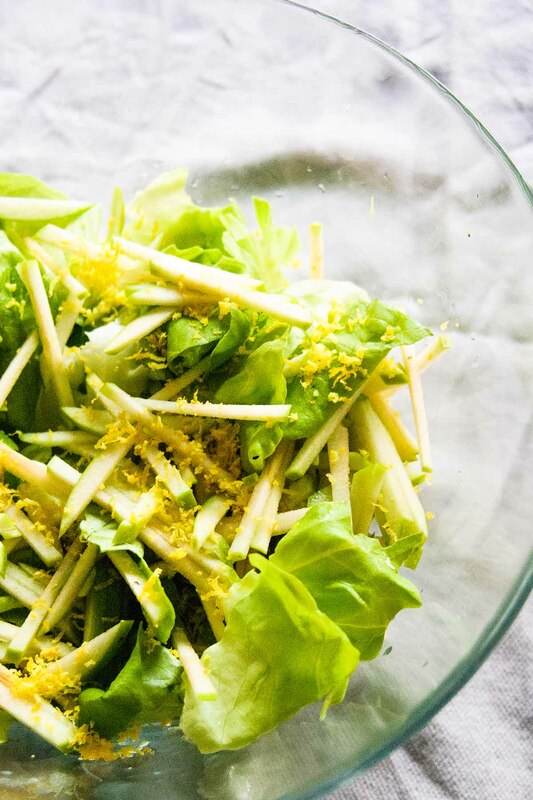 This Lemony Apple Salad recipe is one to keep in the books for when its fall and Mother Nature thinks it’s still summer. Or whenever you’re feeling like your tastebuds need a refreshing dance! 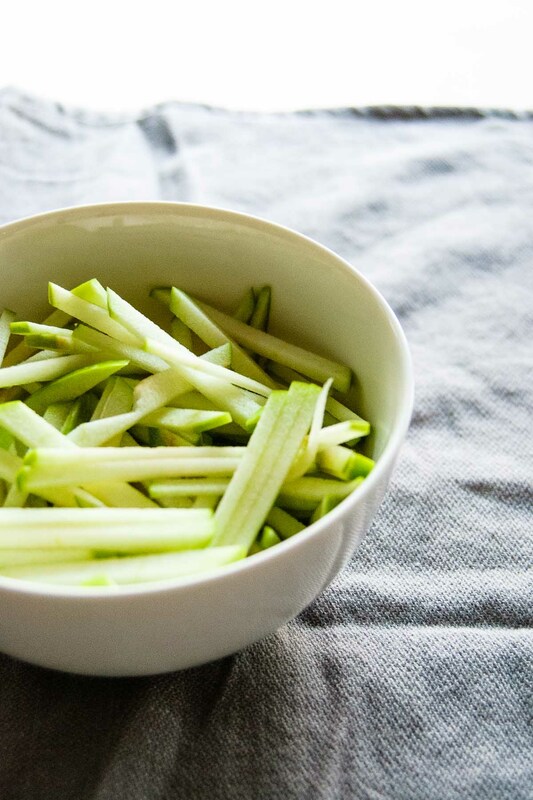 I personally think it’s great as a starter salad, or as a side dish! And I, as well as my family, like it with pork because apples and pork go together like bread and butter. Because of this, this week I have a special little something for all my email subscribers: a third recipe! I will email out the recipe, which by the way goes excellent with this salad, on Monday the 25th of September. Make sure you don’t miss it by filling out the mailing list form by clicking the link below! 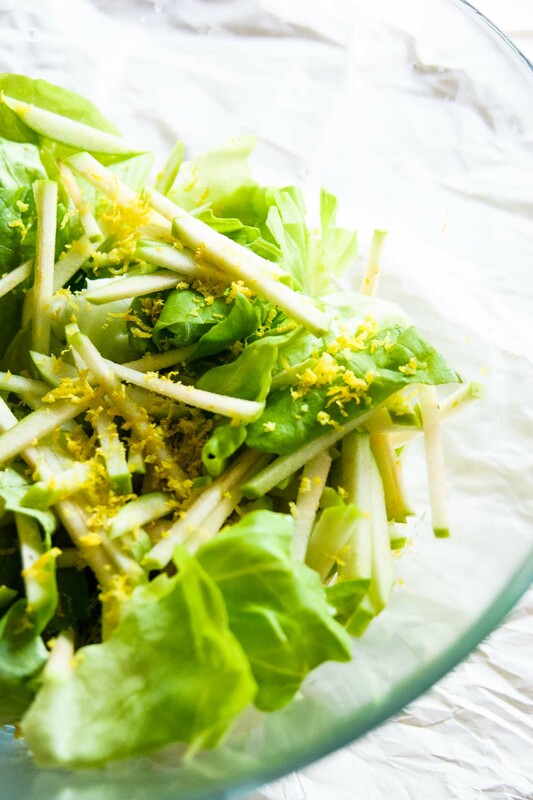 In a large bowl toss together: lettuce, apple and lemon zest. 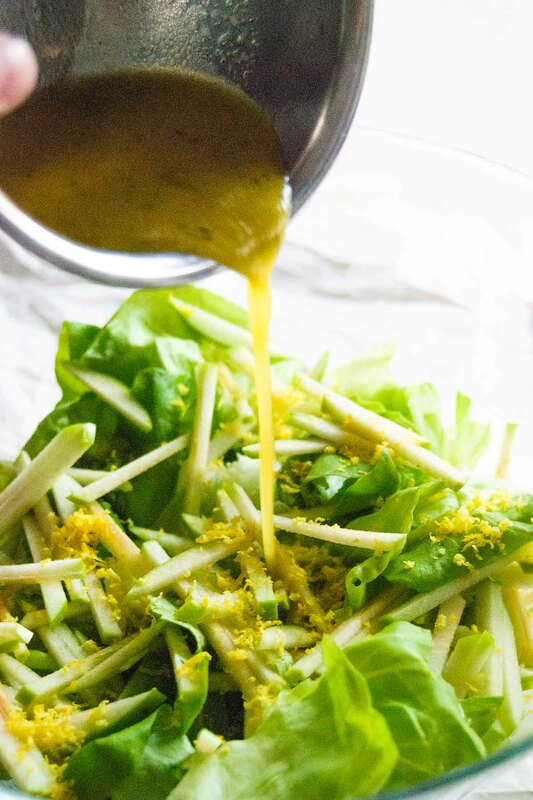 In a smaller bowl make the vinaigrette by whisking together the olive oil and lemon juice. 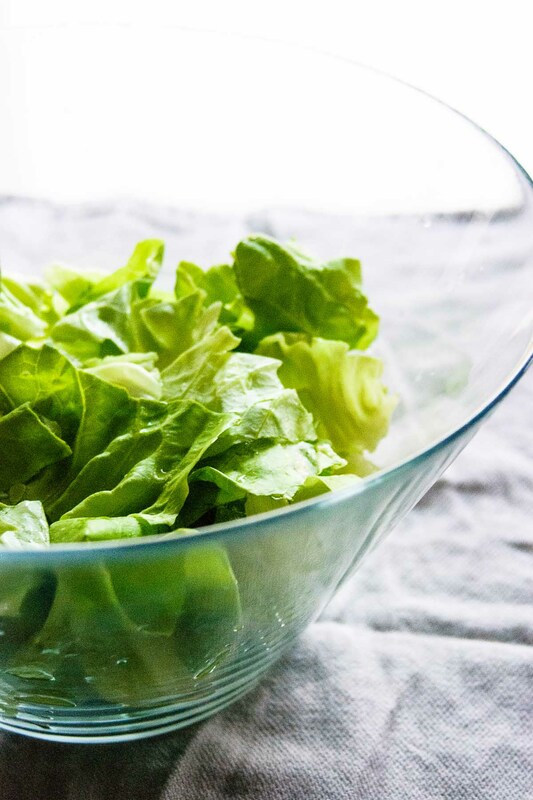 Pour over the salad and season with salt and pepper to taste! This salad serves two people if it is the only side dish being served; four people if there are other side dishes or as a starter salad.